Rudy D'Angelo was born in Pratola Peligna, in the Abbruzzo region of Italy, in 1944 and came to the United States with his mother and younger brother in 1952. His father had already left Italy in 1947 to look for work and had come to the United States by way of Venezuela in 1950. The family settled in Hartford, Connecticut, where Rudy and his brother (and later, two sisters) attended public and parochial schools. Rudy's love of history began early in life, and by the time he graduated Hartford Public High School, he had sailed through five courses of it. 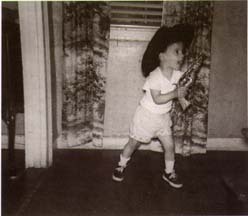 A history and art major, he became interested in our nation's western history as he was exposed to growing up with the TV westerns in the 1950s and early 1960s, and playing with the very same cap guns that are the subject of this study. After service in the army, he returned to Connecticut, where he works as a private detective, his profession for the past 30 years. Always a collector of antique weapons and militaria, it was finding one of the many cap guns that he used to play with some 15 years ago, that sparked the wide-eyed youngster from within to start actively collecting, studying, and researching the cap guns and rifles. "My parents gave me values, guidance, discipline, love and plenty of cap guns to play with," recalled D'Angelo, "We were poor by today's standards, but I never knew it." His love of TV westerns got him to write to the western stars of the 1950s and early 1960s, who sent him autographed photos, letters, and short film biographies, all of which Rudy cataloged, and painstakingly saved for the past 40 years. 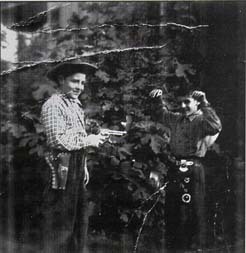 This book and the memories of his youth, his family, and the cap guns that are passionately collected today by many kids of the 1950s and 1960s is the culmination of a love affair and a dream he had harbored for decades. Rudy has one of the best and most complete collections of TV western character cap pistols and rifles in the country, but he is always looking for that elusive western character that has yet to surface. As a military historian and writer, Mr. D'Angelo has collaborated on 23 books, and has written over 90 articles on military history, weapons, and militaria. He also writes on family, social issues, and the highs and lows of his profession as a free-lance writer for several papers and magazines. Mr. D'Angelo continues to reside in Connecticut. with her Dale Evans cap pistol. drop on her brothers with the Fanner 50.